A whole chicken is probably the easiest meat to smoke. Imagine a roasted chicken bathed in flavorful smoke and slow roasted to the point where it melts in your mouth. Smoking chicken is the way it was meant to be cooked. While grilling can do wonders for chicken, the smoker adds so much more flavor. The first step in smoking barbecue chicken is to find a good chicken. Don't pick up a shriveled, frozen bird at the supermarket if you can avoid it. Pick out a fresh, plump bird. Avoid any chicken that is packed with "solution." Many chickens these days are mixed with a chemical brine to make it look good and plump. This makes them look good but doesn't make them taste good. You want a large sized bird (4 to 5 pounds) because it's going to go fast. If you're cooking for more than four or five people, consider getting two chickens. It's as easy to smoke two chickens as one. If you can't find a fresh chicken, then buy frozen chicken. Be sure to follow food safety instructions for thawing the chicken. Smoking one 4-pound chicken will take about 3 hours or 45 minutes per pound. Before you put the chicken in the smoker, give it a good wash and trim off any loose fat and skin. Smoke at about 250 F (120 C) until the temperature at the center of the chicken breast reaches about 185 F (85 C) and the thighs reach 195 F (90 C). While it isn't possible to overcook chicken, if the internal temperature gets too far above these numbers the meat will dry out quickly. Chicken is very forgiving, but sweeter woods work best. While a strong flavored wood smoke, like hickory, will work perfectly well, the subtle woods like apple, cherry, or any of the fruit woods work better. They give a smoke that doesn't overpower the flavor of the chicken but still provides a great smokiness. One point to consider with chicken and smoke is that the skin acts as a barrier to flavor absorption and, therefore, the smoke doesn't penetrate as well as it does with roasts like brisket or pork butts. One of the biggest issues with smoking chicken is the skin. 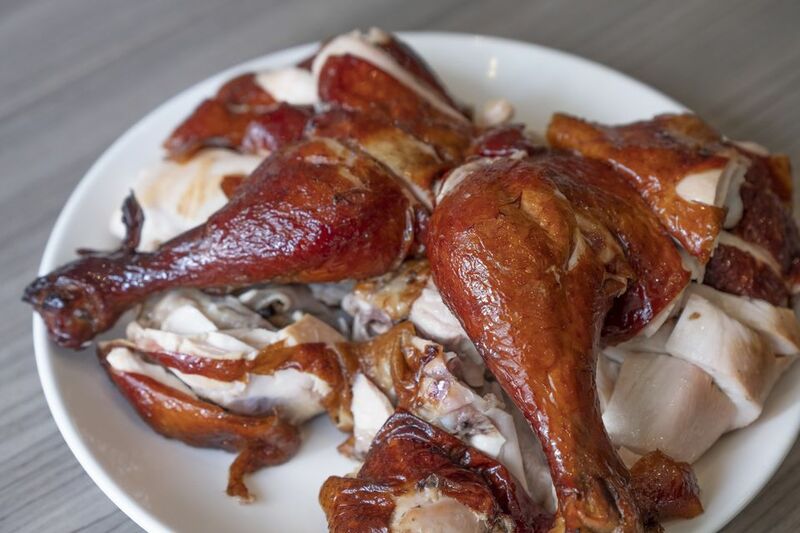 Roasted at high temperatures, chicken skin will render fat and moisture and can become crisp and easily bitten through. Slow smoked, at a low temperature, the skin can become tough and rubbery. The only surefire method to get a good, bite-through skin is to cook the chicken at a higher temperature for part of the cooking time. This can be accomplished by bringing up the smoker temperature to 350 F (175 C) for at least an hour for a whole chicken. This is best done at the end of the cooking time so that smoke can be absorbed early on. Another way to deal with the skin problem is to shred the chicken once it is fully smoked. This will allow you to make pulled chicken barbecue, a quick and easy alternative to pulled pork. This is done by removing the chicken from the smoker and breaking it down into pieces before pulling all the meat from the bone and skin. The large pieces can be shredded with a pair of forks, mixed with a great barbecue chicken sauce, and then put on buns to make fantastic sandwiches. It's a favorite way to serve smoked chicken. Alternatively, a smoked chicken can be carved like any other chicken and served in pieces. With this method, the sauce is optional. In fact, this style of smoked chicken is simply the best-roasted chicken with a smoke flavor that you will ever eat. Carve the chicken once it is fully cooked and place it either under the broiler or on a hot grill for a few minutes to crisp up the skin and bring it to perfection.